CUBA: Why Can't I Have My Cake And Eat It Too? CUBA: Everybody Have Fun Tonight! CUBA: Show Me The Money! Please check the box if you would also like to receive an email when new footage becomes available. When war uproots your life, how do you prepare for a future that you cannot even envision? 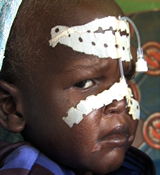 General DVD with 2.10 hours of digital footage of life in Sudan. Transcripts of three interviews translated into English. Comprehensive background information and summary materials (sample) of the footage, including flowcharts (sample). Cutting-edge curriculum: teaching unit (sample) supporting social science standards complete with class activities, grading rubrics, four PowerPoint presentations (sample), lecture materials, graphic organizers, homework assignments, a video on how to use the footage, and student briefing materials (sample). How does living in a refugee camp change a person's values? 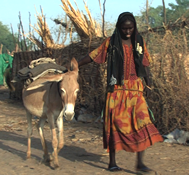 Twenty thousand people live in the refugee camp of Farchana in eastern Chad, which was founded in 2004. There is little vegetation or water, and only basic sanitation. Who are the people who live there, and what happened in their lives to bring them to this place? How does displacement affect a person's view of himself and his values? Or can it offer a wider view of life than ever envisioned before? How can it provide such safety that one looks no further than life in the camp forever? Can they go home again? What if they stay so long in the camp that they forget the life skills necessary to return to their villages? 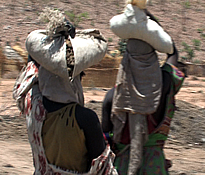 What if their personal changes make it difficult to accept their traditional cultural values? What happens to those who find a new dream in the west? Students will examine these questions through the lens of people living in Sudanese and Chadian refugee camps and through the use of two additional pieces of literature. Teaching Unit Overview: A person’s identity is shaped by one’s own culture, by groups, by influences of one's country and region, and by major events that happen within one's life. What happens to a people when war uproots their life? How does relocation to another country change their identity? Do they look to their connections from the past? Do they struggle to change for a future they cannot envision? Students will meet and examine Hadija and Noura, two women displaced by war in Africa. Students will view their daily lives through personal interviews, investigate the issues these women face, and learn how their personal stories reflect varying points of view. Students will then utilize technology to create media products to inform, entertain, or advocate for change in modern Sudan. One-year, single classroom educational license: $250. Introductory price: $95.